The Old School Diner is located near the Harris Neck Wildlife Refuge at Harris Neck Island, GA.
Take US 17 SOUTH, that’s a Left coming from the NORTH (Savannah) and a Right coming from the SOUTH (Brunswick). Go 1.2 miles on US 17 SOUTH and take a LEFT onto HARRIS NECK ROAD this is just past the Smallest Church in America. You may miss it because it is so small! Stop by for a visit. Go 5.7 miles EAST to Jessie Grant Road to take a RIGHT and look for the Small “Old School Diner” sign on your the right side of the road, go about 100 feet to the and parking area that is on the right. When you see our “parking carpet” you will know your home! Why carpet? We don’t want sand in the building! Just print this page to take with you! BING MAPS WILL NOT WORK USE ONLY GOOGLE or APPLE MAPS FOLKS! The above is our address, but we ARE NOT located in Townsend, GA but that is where our mail goes to. Townsend is about 25 miles from us! 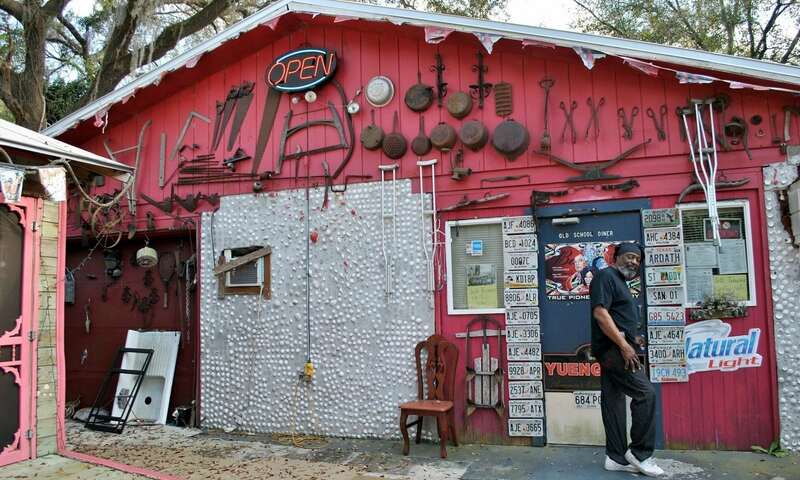 DO NOT BE MISLEAD AND DO NOT GOTO TOWNSEND, GA.
Trust our directions and/or Google/Apple Maps!